All transactions are safe and secure with a reliable history in online purchasing behind each of our associates. 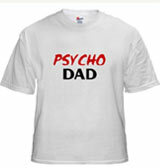 Buy the Psycho Dad t-shirt to own Married with Children clothing and merchandise. Who's that riding into the sun? Who's the man with the itchy gun? Who's the man who kills for fun? Psycho dad. Psycho dad. Psycho dad! Ah yes, the theme song to Al's favorite TV show. Perhaps it's because he is one of the few men Al can relate to. Too bad for Al that Darcy worked to have it cancelled, citing extreme violence. If you are ever feeling like a Psycho Dad, this tee is for you. In addition to the Psycho Dad tee above, browse the Married with Children Clothing Gallery for more apparel like men's and women's clothes, kids shirts or hoodies.